My name is Mary Couey, formerly Mary Warren. The pictures you see of the young man on the cover and on the following pages are of my son Keith Warren. He was nineteen years old when these pictures were taken. It was July 1986 and Keith had just graduated from Kennedy High School in Silver Spring, Maryland. Like many of his classmates, my son was headed for college and was spending the summer enjoying his friends and working at his jobs at Glenmont Chrysler and Bel Pre Shell. Keith was an extremely likable and personable young man who made friends very quickly and easily. Sometimes, this worked to his advantage; other times it did not. Such was the case in the first few months of the Summer of 1986. Those first few months of new friendships were to be the last months of his life. Keith had fallen in with disreputable people, some of whom may have been involved in drugs. After receiving a phone call, Keith left home to hang out with some of his friends. Wednesday he did not return. Growing concerned, I called around to inquire about my son, but to no avail. I then notified the Montgomery County Police at the Wheaton/Glenmont Station. I was informed that unless he was an invalid or on medication, they would not look for him until 48 hours had passed. Paramedics at the nearby Fire and Rescue station received a call from a girl who claimed a suicide had been committed in the basement of the house from which she was calling. The address is 14655 Tynewick Drive, Silver Spring, Maryland. Rescue personnel arrived on the scene with paramedic Dallas Lipp in charge. Three people, including Mr. Chip Wynn who resided in the house, were seated at the kitchen table. A young lady named Claudia “Michelle” Lawson, who was Mr. Wynn’s girlfriend, was also present. It was Ms. Lawson who had called and reported the suicide in the basement. Mr. Lipp informed the people that he was responding to the girl’s call about a suicide and asked to be directed to the basement. He was advised that the body was in the woods a short distance from the house. Montgomery County Police Officer Luther Leverette from the Wheaton-Glenmont Police Station responded to the scene and took charge. It appeared that Officer Leverette knew my son Keith and also knew Chip Wynn. Officer Leverette immediately ruled my son’s death a suicide. Via telecommunications, Officer Leverette contacted the County Coroner, John Rogers, and told him there was no need for him (the Coroner) to come to the scene, and that he should just mark the death down as a “suicide.” Officer Leverette stated in his report that Keith had “Apparently jumped off of a log.” The paramedic stated that there was no log or any other thing from which Keith could have jumped. Officer Leverette had the body removed from the tree and sent to Collins Funeral Home in Silver Spring with instructions to have the body embalmed immediately. Again, proper police procedure was not followed. Why? In accordance with proper police procedure, an autopsy and toxicological tests should have been performed on my son’s body. Neither an autopsy nor a toxicological exam was performed. Why? Further, even though three forms of identification were found in my son’s pockets, it wasn’t until seven hours later that I, the next of kin, was notified of his death. Why? My next door neighbor gave Officer Leverette my work number and the use of her phone. He refused to call me and told her to have me call him when I returned home from work that evening. My neighbor called me at work and said that an Officer Leverette was looking for me and to call him. She was upset, but wouldn’t tell me why. I called and was told that Officer Leverette was out on another call and would not be available for at least two hours. Two hours later, Officer Leverette showed up at my place of work and produced a swimming pool ID card of Keith’s and asked if that was my son. I confirmed that it was, and that my son had been missing for two days. I asked if the officer had found him. Officer Leverette responded that yes, he had been found and he had committed suicide. He questioned me as to any reasons why Keith would have committed suicide, preying upon the innate pain and guilt that any mother would feel when receiving such a message. I cooperated with him the best I could while agonizing over this revelation. At the time, I trusted Officer Leverette. Even though I could not think of any reason why my son would take his own life, I tried to think of any recent disagreements between my son and me. The only thing that came to mind was my strong objection to Keith’s choice of a car. 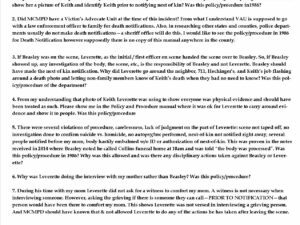 Officer Leverette later exaggerated my statement and used it to substantiate his own creation of a reason. It was Office Leverette’s idea that Keith had become depressed over this and committed suicide. Although Keith had no history of drugs, I asked Officer Leverette several times whether or not drugs were involved, given the fact that the area of Aspen Hill in which we lived had reported drug activity amongst teenagers. He emphatically replied, “No.” Upon his departure and hour later, Officer Leverette handed me a business card from Collins Funeral Home in Silver Spring and told me to contact them after 9:00 a.m. the next day. I called my brother who immediately went to the funeral home to identify the body but was denied entry three times and told to come back the next day. Keith’s clothes and was told by the funeral home director that they (the funeral home) had destroyed his clothes because my son’s body had severely decomposed and deteriorated the clothes. I have never heard of that happening within two days, and I make my living working in pathology. I then requested the noose and rope. I was told that it was in the possession of the Montgomery County Police. My brother and I went to see Officer Leverette who gave us a brown bag containing the rope and Keith’s brown boots which he said Keith was wearing at the time he was found, along with a few other items. A few days after the death of my son Keith, the Montgomery County Police went to the woods and chopped down the tree, stating that they needed it for evidence. My son’s death was ruled a suicide, and the police called it an “open and shut” case. Why then did they need evidence? Were they worried that someone else would have looked at the tree and been able to determine that this was not a case of suicide by hanging, but that my son died elsewhere and was later put in the tree? 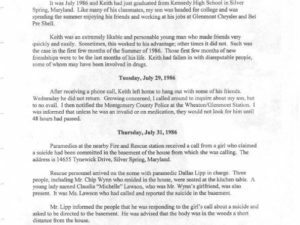 I have never believed my son committed suicide and have constantly pursued an investigation with each of the Montgomery County Police Chiefs, the State’s Attorneys, and the County Executives in office from the time of Keith’s death to the present. I am always met with cordial expressions of sympathy, only to be cut off soon after. People who confided to me that they thought something was suspicious and that they would investigate now avoid communications with me as though they have been silenced by an empowered authority. The following defensive or inappropriate remarks have been made by several Montgomery County Police Officers: “I don’t care how many lawyers she hires, it will not change the ruling of suicide.” “If you had been a better mother, this wouldn’t have happened.” “She is an emotionally distraught mother who cannot come to terms with her son’s death.” It is implied that I am having a hard time letting go. dead and have let go of any false sense of guilt. What I have not let go of is the fact that there is more to this story than I am being told! Had he still been alive, this would have been my son Keith’s twenty-fifth birthday. I returned home from work to find a manila envelope addressed to me on my front porch. There was no return address. I opened it to find the five pictures of Keith you see in this booklet. These are copies of the original police photos taken of the scene which I had never seen and are classified to the Montgomery County Police photo archives. How did they end up on my porch? Who put them there? What was the message? Also contained in the envelope was a note. This note said that two friends of my son’s, Mark Finley and Unnamed, would be next. Four months later, Mark Finley was killed in what was called a “freak” bicycle accident. Subsequently, my car was broken into, and among other things taken, was this note. I did not recognize any of the clothes Keith was wearing. Like any mother who often did her son’s laundry, I knew his clothes. Keith was not wearing his brown boots as I was told by Officer Leverette. He appears to be wearing white running shoes. He is almost sitting with his feet touching the ground. It does not look as though he jumped from atop anything. It appears he was hoisted up after he was dead. Police officials were shocked that I had somehow received copies of their pictures; they could not explain how or why, but were now willing to meet with me with what I can only describe as an attitude of trying to ease my mind and prevent me from stirring up any trouble. Despite the new developments, the police still refused to conduct an investigation into Keith’s death. After making the aforementioned astounding discoveries and after sensing that lies were being told and a cover up was in effect, I requested to see the tree the police had in evidence. I was told that it had been destroyed by a fire which broke out in the storage facility at police headquarters. Keith died the police did a “poor” and “sloppy” investigation, but refused to have the case reopened. A social group called CLAMS (Chatter, Laughter and Mingling Society), which was founded over thirty years ago, became interested in my cause and helped raise the thousands of dollars it cost to have Keith’s body exhumed and to hire independent pathologists and forensic experts to conduct an autopsy and toxicological exams. Five independent pathologists from around the nation examined and tested the remains of Keith’s body. They concluded that Keith had died from the inhalation or ingestion of toxic chemicals prior to being placed in the tree. These results were given to Dr. John Smialek, the Chief Medical Examiner of the State of Maryland. Without even reading the results, Dr. Smailek refuted everything stated by the independent pathologists and brushed off their report by stating that the chemicals found in Keith’s body were from the embalming fluid used after he had died, maintaining that my son hung himself from the tree. The Keith Warren case became the subject of the TV show, Unsolved Mysteries, which has aired several times since 1992. After it had aired, a girl in Alabama called the phone number given at the end of the progarm and claimed to have dressed Keith’s body. Now, for reasons unknown, she is not forthcoming with details. She did not explain why Keith’s clothes were off in the first place and why she dressed him in someone else’s clothes. However, her tip confirms that Keith was, as we believe, dead before seen hanging from the tree. I have personally asked Chief Carol Mehrling of the Montgomery County Police Department to investigate these circumstances. She has refused. the Montgomery County Police Department will continue its investigation into her case. I commend Chief Mehrling on her tenacity. However, why is this family entitled to a continuing investigation when my family was denied even the initiation of an investigation. With the joint cooperation of the Montgomery County Police, the Office of the County Executive, the Montgomery County State’s Attorney’s office and the Office of the Governor, several trips to Israel have been made in a massive effort to bring back a suspect named Samuel Sheinbein in the gruesome murder of a young man named Alfredo Tello in September of 1997. I commend and support all of these massive efforts and the people initiating them. However, why wasn’t even a small effort to find the truth made on behalf of my son and his family? In July of 1991, a two-year-old Hungarian Shepherd named Vader ran away from his handler while training for the Montgomery County Police K-9 Unit. Foot, horseback and helicopter searches were conducted to no avail. In a last ditch and desperate effort, the Montgomery County Police called in a psychic from Baltimore to locate the missing dog. Why was my family denied any attempt on the part of the Montgomery County police to try and find out what happened to my son? Why couldn’t Keith’s death have been awarded one iota of the compassion shown to the Dior and Tello families or to Vader the canine? The only person involved in law enforcement here in Montgomery County who is avidly interested in finding out the truth about the Keith Warren case is Montgomery County Sheriff Raymond Kight. Sheriff Kight has gone against the status quo position of many of his law enforcement colleagues and has sided with me to get to the bottom of this case. County Council Hearing on Police-Community Relations. Enforcement Agencies (CALEA) hearing re accreditation for the MCPD. 1998: Letters from Mary Couey to Hon. Constance A.
sting that went wrong — and that’s why Keith died. Mark died, Mark told Mr. I. that he and unnamed set Keith up. January 25, 1999: Letter to Connie Morella from Bill Lann Lee, Acting Assistant Attorney General, Civil Rights Division, DOJ (in response to Connie Morella letter to Janet Reno) stating that the statute of limitations for police corruption or cover up is five years.unnamed called DOJ to ask questions about Bill Lann Lee’s letter. Pascale Cure, paralegal in Criminal Section of Civil Rights Division said that the attorney who drafted the letter for Mr. Lee’s signature was Linda Quash. January 25, 1999: unnamed called States Attorney’s Office, Montgomery County, Maryland. aide. Ms. Schneider said someone would call back. case or the letter she drafted for Mr. Lee’s signature.Unnamed and Ms. Quash talked for some time about the case and the possibility that another department at DOJ might be able to help, or, if asked provide assistance to the State’s Attorney should he choose to reopen the case. Ms. Quash said she would look into it and call back the next day. January 29, 1999: Unnamed called Linda Quash. She still sounded hesitant about an answer. Said she would call back before close of business (but did not). of the CLAMS. Zach Grant of the Montgomery County Sheriff’s Office shares a new lead (girl who said she dressed Keith’s body in the wrong clothes at party where something was put into Keith’s drink). Mr. Grant said it might be hard to get the girl to talk, but that they would keep trying. February 1, 1999: Linda Quash called Unnamed and apologized for not calling back on Friday. She said that regrettably, DOJ can’t do anything because of the statue of limitations for both civil rights and police corruption/cover-up. She said that if it weren’t for the statute, this would be the kind of case they would investigate. Ms. Quash expressed interest in the case and said to go ahead and send the Keith’s story and pictures for the file. Unnamed called Minnie Anderson at Connie Morella’s Office. Unnamed explained to Ms. Anderson that even another investigator at DOJ did not know about the statute of limitations on police corruption/cover-up, so should not feel embarrassed for asking. Unnamedmentioned to Ms. Anderson that we were planning to meet with Doug Gansler. Ms. Anderson said that it would be fine if Mr. Gansler wanted to call Connie Morella’s Office to verify her support for the validity of Keith’s case. Meeting with State’s Attorney, Doug Gansler. Present: Doug Gansler; his deputy, Kay Winfree; Sheriff Kight; his deputy, Zach Grant; Mary Couey, Keith’s mother; Daryl Davis, friend of the family; Unnamed, friend of the family. Highlights: (1) Unnamed presented the story of the case. 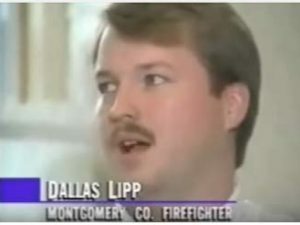 (2) Dallas Lipp described his impression of the scene (kids who called in didn’t act distressed like most people who call in a death; tree was 4-6 inches at the base at the most; nothing for Keith to jump off of; Dallas Lipp never thought it was suicide. (3) Zach Grant updated the group on the tips the Sheriffs Office has been following, specifically Kim Wilson, who said that Keith’s drink was spiked at a party, and that she helped dress Keith’s body in the wrong clothes. 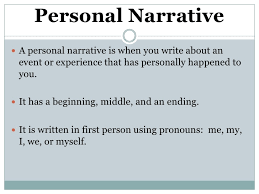 (4) At the end, Doug Gansler asked unnamed what they thought happened. The response was “Of the three options, suicide, homicide or accident, I think suicide is the least likely.” Mr. Gansler replied: “I agree.” See letters to Mr. Gansler regarding meetings in the Exhibits at Tab 67.